Ever wondered, what if you are far from the city on an unknown route, and want to know the nearby restaurant or petrol station? Or lost on a unknown road and anxious to spot your exact location? What will you do in such situation? Now, here what you need all is mobile phone or tablet with augmented reality feature- and rest is all set for you. Over the last decade, the Mobile Augmented Reality has evolved largely. With the development of wearable AR, the first instance of Mobile AR will not be wrong to associate. With the advancing time, the transformation and miniaturization of physical devices and displays, the concept of mobile AR took the pace and evolved towards the notion of the mobile device. With the AR advancement - there exists a huge concern to enrich maps feature. Launched last year, the new AR feature available for the free subscription of OS Maps follows hot on the heels of the award-winning 3D map and route planning features. The development team is constantly working to improve OS Maps and more new features. Currently, more than 1.2 million routes are available in the app. Both Landranger and Explorer mapping gives a better excuse to get ready and explore! In this blog let’s have a clear understanding how the augmented reality in maps are aligning the users with the exact location. Here, we will help you explore new features in Google maps that have certainly eased the job of developers. 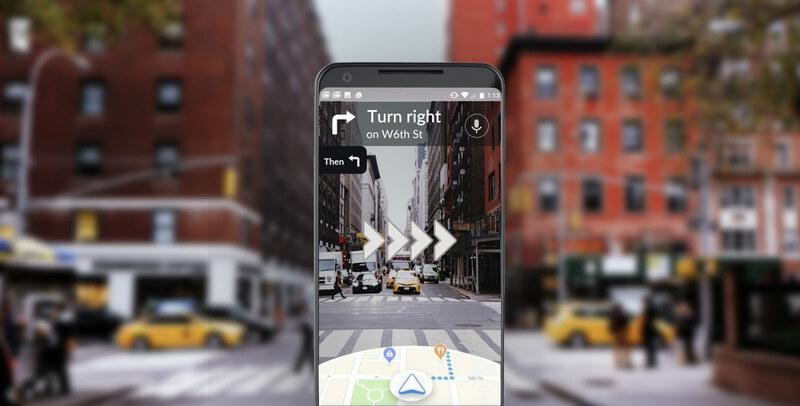 Recently at I/O Google showed off new features for Google Maps, and it's interesting to note an augmented reality Street View mode, to help users with the real-time directions. This will include personalized recommendations with landmarks, helping to discover neighborhood places. Another exciting feature incorporates, the new AR features combined with Google’s existing Street View and Maps data. This will allow having a live feed from your phone’s camera. Interestingly, this will overlay walking directions on top of the real world, making you understand where way to go. Moreover, apart from directions, the new AR mode allows to figure out nearby places. To make directions more clear to users, Google is planning and testing to add helpful augmented reality animal guide. It will be advantageous to lead the way, however, it’s not yet clear how soon this demo will get live. The developers are endeavoring to on go like the natural place for Google’s machine vision tech to go. Further, the Maps is also getting a new tab called “For You”. What you can encounter here is recommendations features specifically customized according to the user's requirement. The new “match number” system, in the Google, will generate a personal score based on your past likes and reviews, as well as saved food preferences, attributing the more personalized recommendation. For instance; Maps will know whether you like ramen or pizza, and later on, based on your reviews it can provide its recommendations. More sharing and caring with Google, as it’s adding more social features to Maps. this will enable users to share multiple places with friends using a single action, and in real time vote to decide where to go. This will be done without having to leave the app. Later this summer, it is expected that Google will bang with augmented reality directions. However, no release date is yet confirmed, but the new social and recommendations features for Maps are set to come to both Android and iOS.